The pelvis consists of the ilium, sacrum, and pubis. The pubic bones articulate in the front of the pelvis via the pubic symphysis. The Ilium and sacrum articulate behind at the Sacroiliac joints. Like other joints in the body the sacroiliac joints and the pubic symphysis can be a source of symptoms as well as dysfunctions which may need compensatory accommodation elsewhere in the body. For years clinicians have debated whether the Sacroiliac joints are mobile, but this is not really in debate anymore as numerous studies have found small movements are available, (ask any woman who has delivered a baby if the pelvis is mobile). Pain referred from the SIJ can be similar to that caused from lumbar disc pathology as well as facet joint pathology. It may be found starting on the sacrum and radiating to the buttocks down to the lateral ankle but rarely into the foot. Dysfunction of the SIJ can arise due to trauma like a motor vehicle accident, a fall on the buttocks, a step off of a curb, and others. 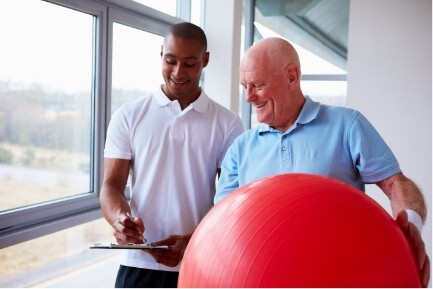 Physical Therapy assessment of SIJ dysfunction includes standing assessment for posture, various movement tests, and positional testing of the bony elements of the pelvis, ligament testing, and palpatory testing. If a movement assessment determines a side of restricted motion, then positional testing verifies the diagnosis, of which there are at least 8 variants per side. Once a diagnosis of pelvic somatic dysfunction has been made, then treatment starts which likely would include either high-velocity low amplitude manipulations or muscle energy techniques. Counterstrain treatment can also be very effective. The goal of treatment is to normalize motion, decrease muscle spasms, and decrease pain. SIJ dysfunctions usually are corrected rapidly given the diagnosis is correct. Patients may also present with instability of the SIJ. Patients who have recently given birth, are lactating, those with autoimmune disease, connective tissue disease, been on long term cortisone use, and others may be more prone to this condition. In these cases correcting positional faults along with strength and stability exercises to develop patterned motion in the anterior and posterior oblique slings is essential. Bracing may also be required. The physical therapists at Sports and Orthopaedic Therapy Services are experts in assessment and treatment of pelvic somatic dysfunction. Contact Sports & Orthopaedic Therapy Services in Silver Spring, MD for more information regarding how our physical therapist can improve your pain and mobility/stability at the SIJ.